If you’d like to know when your campaign or organization receives a donation over a certain dollar amount, you can set up an alert for one or all of your forms. To set up alerts for a specific form, go to the Contributions Form tab in the menu on the left side of your Dashboard. Then, search for the form and click on the form name. This will take you directly to your contribution form, where you can click on the "Alerts" button on the left side of the page. Then, click on “New alert” and configure your options in the next pop-up screen. Here, you can choose which admin receives the alerts, decide if you want alerts for contributions or refunds, and set the alerts threshold. Make sure to save your alert before exiting this screen! 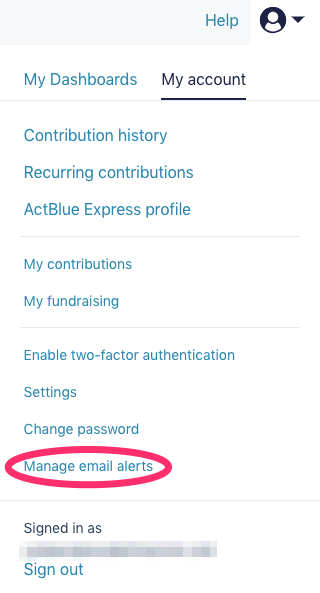 You can also set up contribution alerts for people who aren’t administrators on your candidate or organization’s ActBlue account by typing their email into the email box rather than selecting one from the dropdown menu. Third-party contribution alerts are a fun way to keep family members and friends involved, even if they can’t create forms or access the back-end of your account. It’s also a great way to share fundraising progress with anyone who might be hosting a party for your candidate or helping out with your organization’s big fundraiser. If someone has not created an ActBlue account, they’ll get an email asking them to create a password. Either way, they’ll get a confirmation email letting them know they’ve been signed up for alerts. Although it might be tempting to hear from us every time you receive a donation, we recommend choosing a relatively high number so you won’t be inundated with emails. To set up email alerts for all contribution forms, you’ll need to go to your Dashboard and select Email Alerts from the panel on the left side of the page. Click “New campaign alert” and configure your alerts. You can create a new alert for any admin on your campaign, or create an alert for a third party by clicking on the link. There’s also a “Manage email alerts” option in your User menu in the top right of your screen. 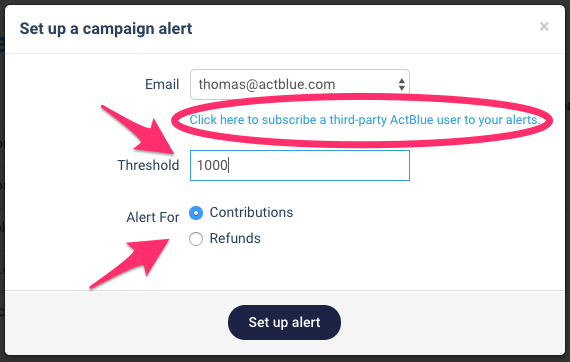 If you’ve set up alerts for more than one contribution form or campaign, you can visit this page to keep track of everything.